White giant. Thanks to its 18.4-inch screen, the Samsung Galaxy View stands out from the majority of tablets. This does, however, also affect the weight and the size. Where can you use such a tablet and can it convince in terms of technology? 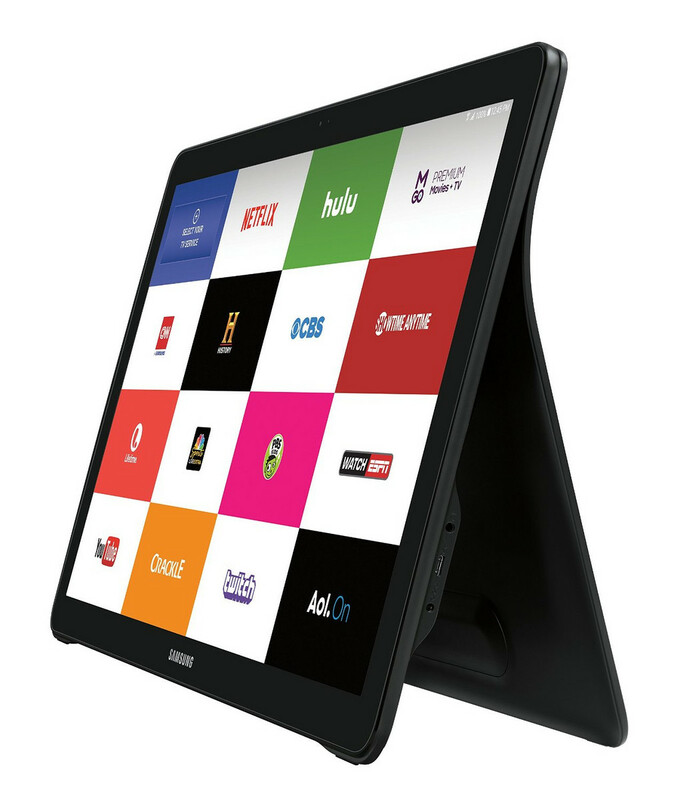 The Samsung Galaxy View isn’t your conventional, mainstream tablet meant to bridge that smartphone and laptop experience into one – it just doesn’t, even though it works nicely as a productivity-centric device. It’s certainly a conversation piece that will surely get it noticed wherever it’s brought, but we struggle to believe it’s the most suitable thing. Few tablets ever eclipse the 10-inch mark, seeing that anything bigger prevents them from being as easily carried around. This one proves that point poignantly, but again, its sheer size is arguably its strongest asset in garnering attention. Sure, it’s advertised to deliver the ultimate mobile video experience, which it does, but only because of its larger-than-normal sized screen. As much as Sammy wants it to succeed in being the ultimate mobile viewing device, we just don’t feel there’s much of an incentive to choose it over other, more compact and discrete things. When I first read of the Samsung Galaxy View I almost fell off my chair laughing at the ridiculous idea of a massive tablet that required a built-in handle to move it around. I then spent a couple weeks with the AT&T model and think it may be perfect for the right buyer. I have a small eight inch tablet that I use primarily for watching English Premier League football via the NBC Sports Live Extra app, Netflix, Amazon Video, and Google Play movies. It's nice for watching this content on an airplane or during my daily commuter train ride, but something much bigger like the Galaxy View is more enjoyable around the house. There are people who live without multiple TVs in their homes, those who do not have television service, and those who want a device for their own media experience. 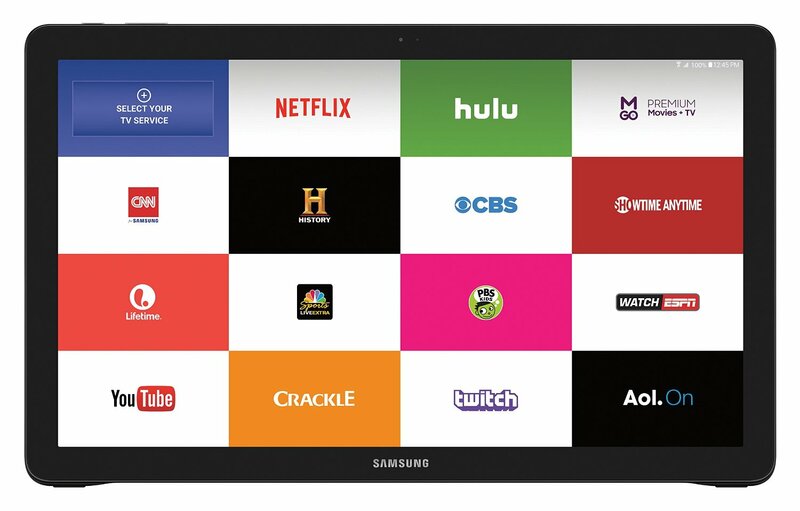 The Samsung Galaxy View is a cord-cutter's dream and could easily serve as the only streaming media device for many people. 40% Test : Samsung Galaxy View, à quoi peut bien servir une tablette géante ? Positive: Good viewing angles, good brightness; decent hardware. Negative: Weak sound system; poor appearance. Model: Centred to be an immersive, somewhat portable multimedia system, the Samsung Galaxy View is bound to keep many users entertained. 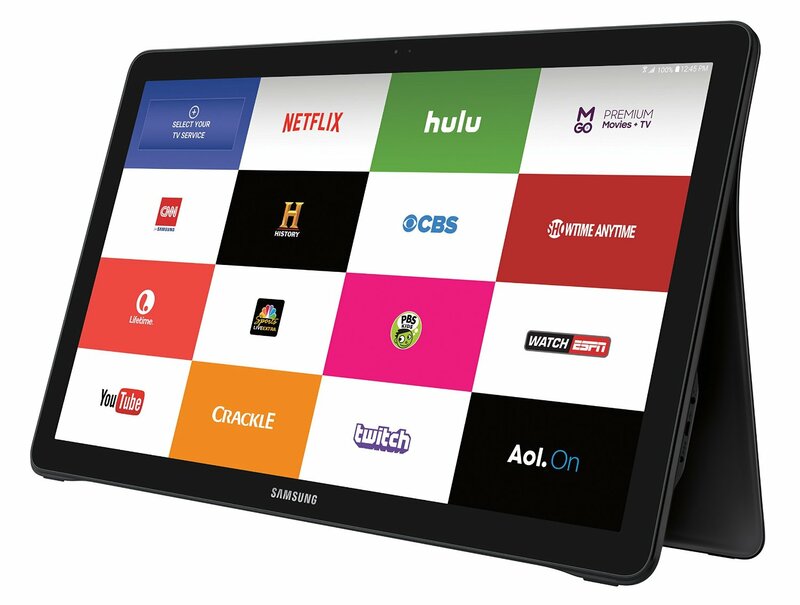 From the front, the Samsung Galaxy View looks like another Samsung tablet with rounded edges and two color options; black and white. It is at the back that differentiates it from other devices with a built in handle for ease carrying and an inbuilt stand system. 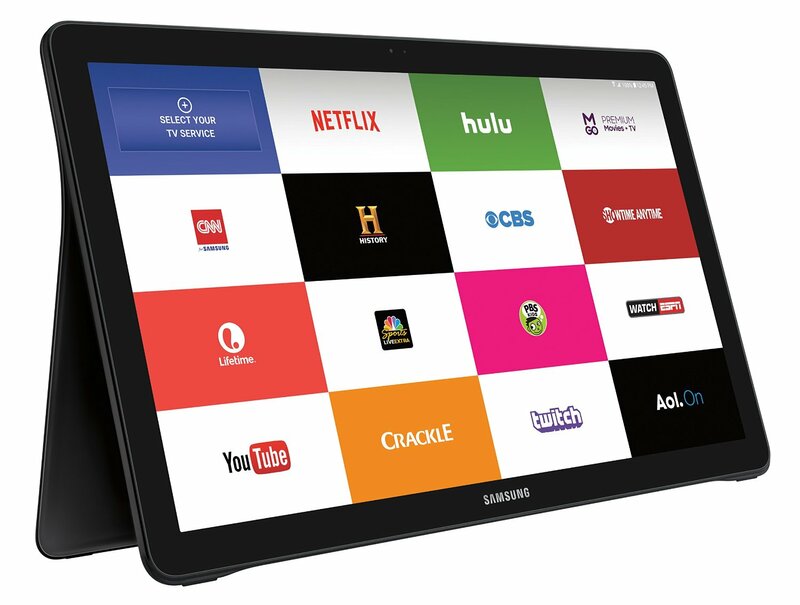 The Samsung Galaxy View comes with a gigantic, capacitive 18.4 inch TFT touchscreen. Colors are beautiful and clarity is adequate at Full HD resolution. This display priorities size over performance but when coupled with the powerful stereo speakers, it provides a wonderful experience nevertheless. The Android 5.1.1 Lollipop device comes equipped with a Cortex-A53 octa-core processor clocked at 1.6 GHz, 2 GB RAM and either 32 B or 64 GB internal storage depending on the variant. Furthermore, there are WiFi-only variants and Wi-Fi + 3G/4G setups. 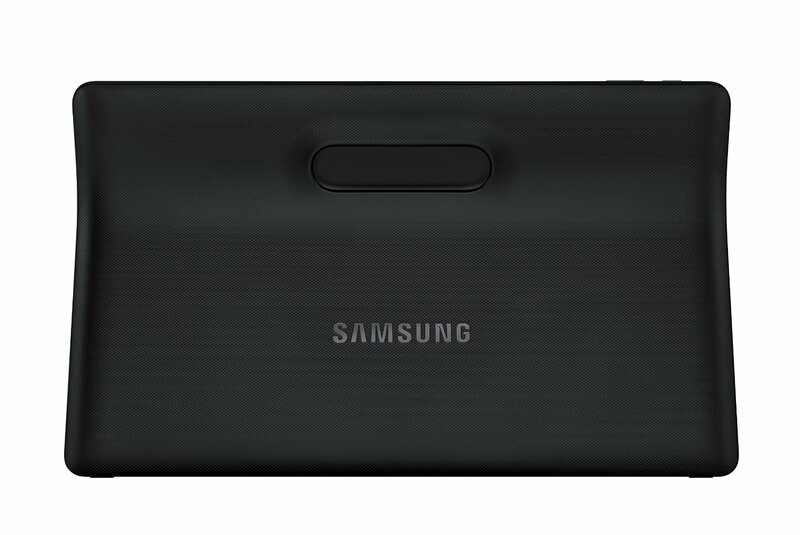 Other features include a 2.1 MP front camera, Bluetooth 4.1, A-GPS and microUSB 2.0. The Samsung Galaxy View comes into its own when coupled with services such as Netflix, Hulu and other multimedia apps. Battery life is provided by a non-removable Li-Ion cell rated at 5700 mAh allowing for up to 8 hours of multimedia playback. 7580 Octa: Octacore SoC with four Cortex-A57 and four power saving Cortex-A53 cores manufactured in 28nm.» Further information can be found in our Comparison of Mobile Processsors. 65.1%: This rating is bad. Most notebooks are better rated. This is not a recommendation for purchase.